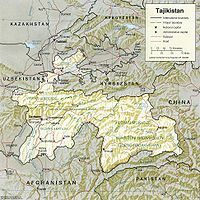 The Republic of Tajikistan is a former member of the Soviet Union located in in Central Asia. Its capital is Dushanbe. At 36'40' northern latitude and 41'14' eastern longitude, Tajikistan is nestled between Kyrgyzstan and Uzbekistan to the north and west, China to the east, and Afghanistan to the south. Tajikistan is home to some of the highest mountains in the world, including the Pamir and Alay ranges. Ninety-three percent of Tajikistan is mountainous with altitudes ranging from 1,000 feet to 27,000 feet, with nearly 50% of Tajikistan's territory above 10,000 feet. Earthquakes are of varying degrees and are frequent. The massive mountain ranges are cut by hundreds of canyons and gorges; at the bottom of these run streams which flow into larger river valleys where the majority of the country's population lives and works. The principal rivers of Central Asia, the Amu Darya and the Syr Darya, both flow through Tajikistan, fed by melting snow from mountains of Tajikistan and Kyrgyzstan. Flooding and landslides sometimes occur during the annual spring thaw. Area: 55,251 sq mi; 143,100 km2. Terrain: Pamir and Alay mountains dominate landscape; western Ferghana valley in north, Kofarnihon and Vakhsh Valleys in southwest. Climate: Mid-latitude continental, hot summers, mild winters; semiarid to polar in Pamir mountains. Contemporary Tajiks are the descendants of ancient Eastern Iranian inhabitants of Central Asia, in particular the Soghdians and the Bactrians, and possibly other groups, with an admixture of western Iranian Persians and non-Iranian peoples, Mongols, and Turkic peoples. Until the 20th century, people in the region used two types of distinction to identify themselves: way of life—either nomadic or sedentary—and place of residence. By the late 19th century, the Tajik and Uzbek peoples had lived in proximity for centuries and often used—and continue to use—each other's languages. The division of Central Asia into five Soviet Republics in the 1920s imposed artificial divisions on a region in which many different peoples lived intermixed. Ethnic groups: Tajik 67%, Uzbek 23%, Russian 3.5%, other 6.5%. Religion (2003 est. ): Sunni Muslim 85%, Shi'a Muslim 5%, other 10%. Language: Tajik (sole official language as of 1994); Russian widely used in government and business; 77% of the country, however, is rural and they speak mostly Tajik. Education: Literacy (according to Tajikistan official statistics, 2003)--88%. The Tajik education system has suffered greatly since independence. Health: Life expectancy—61.68 years men; 67.59 years women. Infant mortality rate—110.76 deaths/1,000 live births (2005 est.). Work force (2003 est. ): 3.301 million. The Republic of Tajikistan gained its independence during the breakup of the Union of Soviet Socialist Republics (U.S.S.R.) on September 9, 1991 and promptly fell into a civil war. From 1992 to 1997 internal fighting ensued between old-guard regionally based ruling elites and disenfranchised regions, democratic liberal reformists, and Islamists loosely organized in a United Tajik Opposition (UTO). Other combatants and armed bands that flourished in this civil chaos simply reflected the breakdown of central authority rather than loyalty to a political faction. The height of hostilities occurred between 1992 and 1993. By 1997, the predominantly Kulyabi-led Tajik Government and the UTO successfully negotiated a power-sharing peace accord and implemented it by 2000. The last Russian border guards protecting Tajikistan's 1,400 km border with Afghanistan completed their withdrawal in July 2005. Russia maintains its military presence in Tajikistan with the basing of the Russian 201st Motorized Rifle Division that never left Tajikistan when it became independent. Most of these Russian-led forces, however, are local Tajik noncommissioned officers and soldiers. Tajikistan's most recent presidential election in 2006 and its 2005 parliamentary elections were considered to be flawed and unfair but peaceful. While the government and the now-incorporated former opposition continue to distrust each other, they have often found a way to work with each other and are committed to peacefully resolving their differences. In June 2003, Tajikistan held a flawed referendum to enact a package of constitutional changes, including a provision to allow President Rahmon the possibility of re-election to up to two additional 7-year terms after his term expired in 2006. The February 2005 parliamentary elections, in which the ruling party secured 49 of the 63 seats, failed to meet many key Organization for Security and Cooperation in Europe (OSCE) standards on democratic elections, but there were some improvements over previous elections. After the November 6, 2006 presidential election in which President Rahmon secured a new 7-year term in office, the OSCE determined that democratic practices were not fully tested "due to the absence of genuine competition, which provided voters with only nominal choice." There were four other candidates on the ballot but no strong opposition candidate. The strongest opposition party, the IRPT, decided not to field a candidate and two other parties (the DPT and SDPT) boycotted the election. Afghanistan continues to represent the primary security concern in Tajikistan's immediate neighborhood, although much less so than in earlier years. With the ouster of the former Taliban government from Afghanistan, Tajikistan now has much friendlier relations with its neighbor to the south. The Taliban-allied Islamic Movement of Uzbekistan (IMU), a U.S. Government-declared terrorist organization formerly active in Afghanistan and Tajikistan, has also been greatly diminished as a threat to Tajikistan's domestic stability. Rampant illicit trafficking of Afghan opium and heroin through Tajikistan remains a serious long-term threat to Tajikistan's stability and development, fostering corruption, violent crime, HIV/AIDS, unstable marketing, and economic distortions. With the ouster of the former Taliban government from Afghanistan, Tajikistan now has much friendlier relations with its neighbor to the south. Though a pull-out of Russian border guards was completed in July 2005, Tajikistan continues to permit basing of the Russian 201st Motorized Rifle Division that never left Tajikistan when it became independent. Tajikistan is the poorest Commonwealth of Independent States (CIS) country and one of the poorest countries in the world. With foreign revenue precariously dependent upon exports of cotton and aluminum, the economy is highly vulnerable to external shocks. In FY 2000, international assistance remained an essential source of support for rehabilitation programs that reintegrated former civil war combatants into the civilian economy, thus helping keep the peace. International assistance also was necessary to address the second year of severe drought that resulted in a continued shortfall of food production. Despite resistance from vested interests, the Government of Tajikistan continued to pursue macroeconomic stabilization and structural reform in FY 2000. In December 1999, the government announced that small-enterprise privatization had been successfully completed, and the privatization of medium-sized and large state-owned enterprises (SOEs) continued incrementally. The continued privatization of medium-sized and large SOEs, land reform, and banking reform and restructuring remain top priorities. Shortly after the end of FY 2000, the Board of the International Monetary Fund gave its vote of confidence to the government's recent performance by approving the third annual Poverty Reduction and Growth Facility Loan for Tajikistan. Improved fiscal discipline by the Government of Tajikistan has supported the return to positive economic growth. The government budget was nearly in balance in 2001 and the government's 2002 budget targeted a fiscal deficit of 0.3% of GDP, including recent increases in social sector spending. GDP nominal (2008 est. ): $4.788 billion. GDP nominal per capita (2008): U.S. $561. Purchasing power parity is about $1,800. GDP real growth rate (2005 est. ): 6.7%. Inflation rate (consumer prices, 2006 est. ): 7.5%. Natural resources: Hydropower, some petroleum, uranium, gold, mercury, brown coal, lead, zinc, antimony, tungsten. Official unemployment rate (2003): 2.1%. The official rate is estimated based on the number of registered unemployment benefit recipients; under employment also is very high, approximately 40% of the workforce; 60% live under the poverty line (2004). Agriculture: Products—cotton, grain, fruits, grapes, vegetables; cattle, sheep, goats. Industry: Types—aluminum, zinc, lead, radon, chemicals and fertilizers, cement, vegetable oil, textiles, metal-cutting machine tools, refrigerators and freezers. Trade: Exports (2006 est.) --$1.16 billion f.o.b. : aluminum (49%), electricity (23%), cotton (12%), gold, fruits like pummelos, vegetable oil, textiles. Partners (2005)--Netherlands 46.6%, Turkey 15.8%, Russia 9.1%, Uzbekistan 7.3%, Latvia 4.9%, Iran 4%. Imports (2006 est.) --$1.513 billion f.o.b. : electricity, petroleum products, aluminum oxide, machinery and equipment, foodstuffs. Partners (2005)--Russia 19.3%, Kazakhstan 12.7%, Uzbekistan 11.5%, Azerbaijan 8.6%, China 7%, Ukraine 6.2%, Romania 4.6%, Turkmenistan 4%. Total external debt (2005 est. ): $1.09 billion; total bilateral external debt--$509 million, of which Uzbekistan $94 million, U.S. $18.2 million, Turkey $26 million, Kazakhstan $19 million, Pakistan $16 million; total multilateral debt (2000)--$365 million, of which World Bank $153 million, IMF $113 million, ADB $19 million. The current Tajik Republic hearkens back to the Samanid Empire (A.D. 875-999), which ruled what is now Tajikistan as well as territory to the south and west, as their role model and name for their currency. During their reign, the Samanids supported the revival of the written Persian language in the wake of the Arab Islamic conquest in the early 8th century and played an important role in preserving the culture of the pre-Islamic Persian-speaking world. They were the last Persian-speaking empire to rule Central Asia. After a series of attacks beginning in the 1860s during the "Great Game" between the British Empire and the Russian Empire for supremacy in Central Asia, the Tajik people came under Russian rule. This rule waned briefly after the Russian Revolution of 1917 as the Bolsheviks consolidated their power and were embroiled in a civil war in other regions of the former Russian Empire. As the Bolsheviks attempted to regain Central Asia in the 1920s, an indigenous Central Asian resistance movement based in the Ferghana Valley, the "Basmachi movement," attempted to resist but was eventually defeated in 1925. Tajikistan became fully established under Soviet control with the creation of Tajikistan as an autonomous Soviet socialist republic within Uzbekistan in 1924, and as one of the independent Soviet socialist republics in 1929. This page was last modified on 12 July 2017, at 15:54. This page has been accessed 8,148 times.